It’s been difficult times here recently; A few weeks ago, it would have been my wonderful brother’s 50th birthday, and the following day marked 18 years since my awesome Dad passed from cancer. Everyone who ever met either my brother or our Dad, would remember them, especially if they’d cooked for them. They touched people all around the world and are forever in my heart. My awesome sister in law and nieces, and his many friends, had a lovely celebration to remember my Brother in Australia. I can’t express how proud I am of them all, and how much love I have for them all – strong women. My Chap and I have been down to see My Mum too, and helped her buy more pots for her garden, and plant new birthday roses and fuchsias, for remembrance. It’s been SO tough for her too. It’s been SO tough for all of us. Spring is coming 🙂 I was excited to see my first snowdrops, a dwarf Iris and crocus buds too. This was despite having two snow showers last Tuesday, it was minus 5 on Wed and more snow overnight on Sunday here in Manchester. The violas are still flowering from my last vase, and a few dwarf purple and yellow ones have appeared too, as well as crocus buds and daffodil spikes coming up. I wrote about violas, self care and there’s no such thing as Blue Monday in my last vase. I picked the cook books to represent where we live (Manchester), where my Brother lived (Melbourne), and a Rick Stein book (one of my Dad’s favourite chefs). All of us love fish, and time spent by the sea. The Mrs Beaton book was my gran’s (Dad’s mum – who was an excellent cook) but I think she must have had more than one copy as there are no notes or recipes scribbled in it. The red and white striped notebook my Dad gave to me, when I went to university in the mid 1980’s, with some useful recipes like boulognese, how to boil rice, and baking cakes. It’s very precious to me. My Brother Matt gave us the Melbourne cookbook and we’d given him, and his family in Australia, The Manchester Cookbook. Cooking food represents our love for our family and friends. All of us love fish and time spent by the sea. Do have a look at Rambling in the Garden where Cathy hosts In A Vase on a Monday – where gardening bloggers from around the world add links to their vases. Always beautiful, interesting or unusual – including plenty of southern hemisphere bloggers who brighten my days in the depths of Winter. This week Cathy has a Japanese Ikibana style black vase with a white Hyacinth. I’ve been reminded again this week of the need to #bekind to myself and do my favourite selfcare activities for me. The cold weather has been tough on my arthritic joints – painful and I’ve been wrapped up with thermal socks on and lots of layers – but moving helps especially something like sewing, crochet or knitting. 12 February 2018 – house filled with lavender, green heart for #showthelove and a candle because I love the scents. There’s something incredibly relaxing about sewing, handling the soft material – creating something – this is a lavender filled ‘house’ I made. I need small, achievable projects like this and hearts. Sewing helps my #wellbeing and concentrating on the stitching ’empties’ your head so to speak. Yoga does this too. We dressed up in 1920s gear, learnt the Charleston, ate cake, picked our bursary winners and had alot of fun as usual. My Chap and I decided to go for a meal at one of the place’s we’d taken my brother when he’d visited -Mr Thomas’s Chop House in Manchester. This venerable tiled green and white Mancunian institution was opened in 1870, serves classic British food, has an excellent selection of Lancashire real ales and an extensive wine list. Sam’s Chop House – samschophouse.com/ – Mr Lowry still sits at the bar. For starter, I had Tom’s cornbeef hash, with pickled red cabbage and poached egg. There is nothing in the world quite like this hash – it is awesome and so good I forgot to take any photos – oops 😉 Followed by steak and kidney pudding. My Chap had scallops and the hash for main course – we had no room for pudding. We had a wonderful lunch, drank a glass of a very good red and then headed off to Manchester Art Gallery, another place we’d taken my Brother. Always great art to see, including Valette’s impressionist paintings of Manchester (he was Lowry’s tutor) as well as many Pre-raphaelite paintings, Victorian high art and regularly changing exhibitions. The next day, Sunday (my Dad’s ‘anniversary’), My Chap cooked a 10/10 Sunday roast in commemoration of Jay. My Dad was famous for his roast dinners and mine and my brother’s pals would scrap over who could get an invite. I’ll be remembering darling My Dad, Uncle Fred, Steve and most of all my wonderful Brother Matt and I’ll continue to raise a glass of quality red, especially if My Chap and I are by the sea. It’s the third birthday of my blog today – Much has stayed the same and much has changed in that time… a bit like me…. I waited a long time for a garden of my own – well into my 40s (12 February 2015) – my first blog post! I’m reminding myself to #bekind (to myself as well). This entry was posted in In a vase on Monday, Manchester and tagged birthday party, In a vase on Monday, iris, kind, kindness, Loss, Manchester art gallery, Sewing, snowdrop, Thomas's Chop house on February 12, 2018 by Bec - views from my garden bench. They’re tête a tête daffodils and one dwarf iris. I don’t know the variety I’m afraid. I bought the bulbs in Wilko last year; they’re a northern chain rapidly spreading south who sell all sorts of things, a bit like Woolworth’s did in the 1970s. They have a really good garden section so do pop in if you’re local and have a look around. The bulbs were planted in a trough in the garden last autumn, which you can see in the distance, and have spent all winter outside. Apologies for not finding a better background but I took these photos in a hurry before rushing out to work this morning – it’s a peek into my garden too. Not much going on at the moment. The vase got a lot of use last summer with Sweet peas from the garden – I have a feeling it will be getting a lot of use this year too. It was a gift from my chap and is only about 7 inches high – I did wonder about putting navy ribbon around it but I wasn’t sure if it would be too over the top. What do you think? I’m very lucky as my chap works in the florist industry (wholesale – everything except the flowers basically). So I have a lot of vases – they’re a lot bigger though. I hope you get to see some of the vases on a Monday – just hope I can grow enough suitable flowers. He buys me flowers often – yes I know I’m a very lucky – think he enjoys the flowers as much as I do and he knows more about flower arranging than me for sure. If you want to see more ‘In a vase on Monday’ have a look at Cathy from www.ramblinginthegarden.wordpress.com – it’s all about picking flowers growing in your garden and displaying them in a vase on a Monday – simple really assuming you’ve got something flowering. She’s got some gorgeous purple hyacinths today. I’ve got a few hyacinths growing in the front garden so lets see how they turn out. They’re nowhere near flowering though. I’m enjoying seeing what everyone else has picked and all the pretty vases. I loved these purple crocuses in the mini bottle vases from Gwirrel’s garden today too. It’s good fun looking around other people’s blogs to see how their flowers are coming along. Such alot of variety of when the daffodils and crocuses are coming up. Elsewhere in the garden, the hellebore is flowering, lots of yellow and purple crocuses as well as some really amazing double head mini daffodils – so fingers crossed I can find something pretty for next Monday. Little did I know that joining In a Vase on Monday hosted by Cathy would lead to me finding many gardening bloggers around the world, with wonderful gardens large and small. It introduced me to many new plant varieties. Looking through the blogs lifts my mood in the darkest days of Winter. Do you follow, or participate, in any links like this? 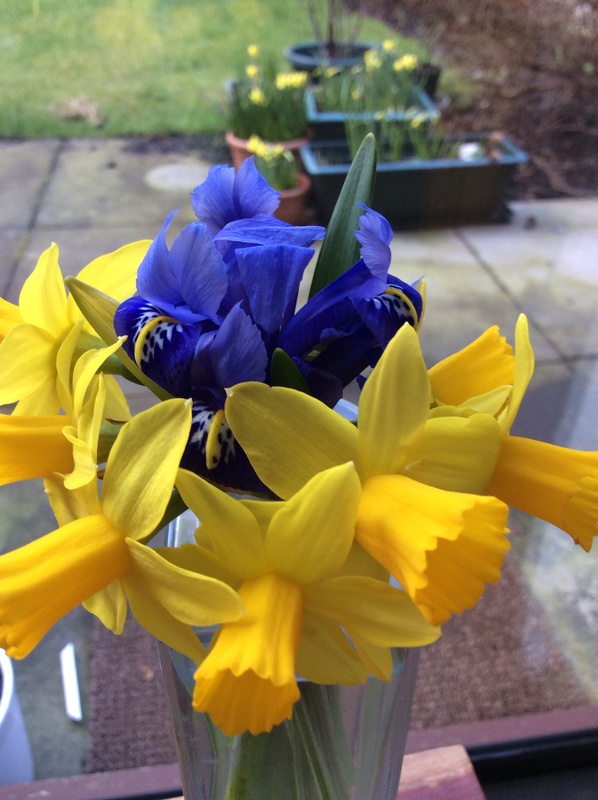 This entry was posted in Gardening, In a vase on Monday and tagged daffodils, In a vase on Monday, iris on March 16, 2015 by Bec - views from my garden bench. whether or no the sun be shining outside. It was horrible weather here at the weekend so I wasn’t out in the garden at all – which made me feel glum. Instead, I’ve been thinking about positive things. I’ve been waiting not so patiently for more bulbs to flower… not a lot is happening though. But every year is different in the garden, as well as in life. Here are the same pots one year apart in exactly the same place – no sign of daffodils and a lot less crocuses this year than last year. 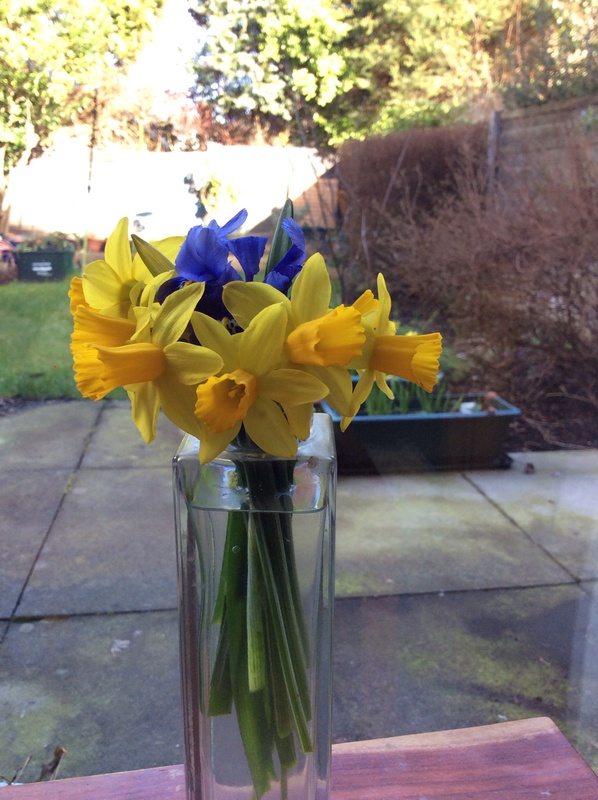 If I was a more organised person I’d have posted these pictures on 1st March – St David’s Day. Instead I’ll just wish you ‘Dydd Gwŷl Dewi Sant hapus’. The Met Office have said it’s been the sunniest winter on record (but not in Manchester clearly – we are one of the grey areas on the Met Office maps) – News release. It just goes to show how much I know, as I thought last winter 2013/14 was cold and wet and that it had been milder this winter. I’d love to have a meteorological station in the garden, but I’d need it to email me the results as I’d forget to take the measurements every day. I grew up in a town where people knew a lot about the weather so I’ve always been fascinated by this topic. P.S. Don’t worry Yoda is still around… he’s been at the bottom of the garden at the moment. He makes me smile everytime I see him. I’ll write about Yoda and my other garden ornaments another time. P.P.S. 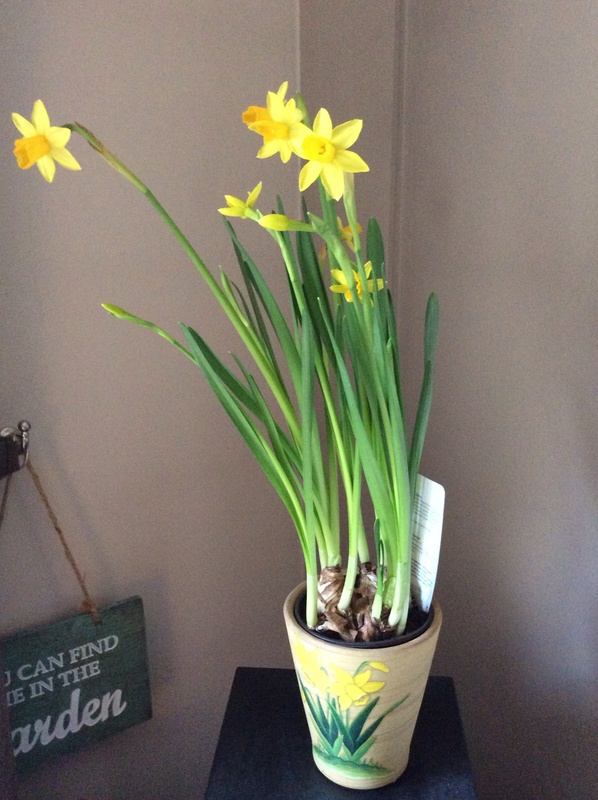 I gave in and bought a pot of tête a tête daffodils from a supermarket – A A Milne would approve. Have you got daffodils flowering yet? or do you have different flowers to signal Spring where you live? This entry was posted in Gardening and tagged daffodils, iris, Met Office, spring, yoda on March 3, 2015 by Bec - views from my garden bench.